Hi! Welcome to the start of a new week- hope it's a good one! I decided that this year I would try new things nail art-wise. I've been trying out designs that are new to me and I've been especially interested in working with decorations- loose glitter, micro beads, etc. This time I went for a drip manicure. It's something I've seen countless times but never tried out until now. I pulled out my pots of loose iridescent glitter in white, pink, and purple and layered it on top of the drips. For the thumb and index I blended the glitter together to create a gradient. Honestly, I really thought that this wasn't gonna work out. I thought that I wouldn't get the glitter placement right but I didn't even have to be too careful with the application. The great thing about these glitters are that they are semi-transparent so they layer very nicely and blend into each other well. I started with American Apparel Coney Island on the index finger, American Apparel L'Esprit on the little finger, and American Apparel T-Shirt on the rest of my nails. Working one nail at a time, I used a large dotting tool to make the ends of the drips, then used the polish brush to extend them to the tips. While the polish was still tacky I dipped the tips into the same coloured glitter. I used a dotting tool to move the glitter around and place additional glitter on the drips. For the gradient nails I first used a sponge and polish to make a gradient base first. Then I applied some topcoat and placed the glitter. Oh wow I love this drip manicure. The pastels are perfect. So girly! Ah! This looks so cool! I love it. I'm such a sucker for a pink/lilac gradient as well. I absolutely love the pastel colors you've used here! And the addition with the gitter - perfect! 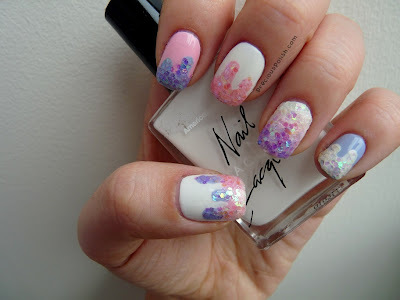 Two of my favs for nails ^.^ This looks like a lot of work, especially the gradient but it was worth it cause it looks amazing! i love these! they're so cool looking. oh my gosh this is so beautiful! Respect for all the patience you have to place the glitter! I don't think I could do it that perfect, well done! The drips look awesome! I love that you used the glitter! This is so gorgeous! I love that iridescent glitter!